Our country, if not the world, is saddened this week with the terrible loss of 19 firefighters who were victims in the raging Arizona wildfires. Our hearts go out to them, to their loved ones, to their community they were working to help. This single event rivals the loss in the fire industry that occurred Sept 11th, 2001. With damage covering more than 8400+ acres (a quadruple-sized jump since when it first began on the 28th of June), it is the worst US wildfire accident since 1933. Those kinds of stats make you sit up and take notice. Additionally too, you sit up when you start to see that the West Coast is emeshed in the perfect storm of a horrible, long-lasting drought and a record breaking heatwave. Human-made climate change was one of the over-riding factors in the rise of Southwestern wildfires in the January 2013 climate report from the Federal Advisory Committee (the NCADAC, also known as The "National Climate Assessment and Development Committee). Check out the fire graph here from Climate Central for the US's top state for fastest rising temperatures: Arizona. When the Washington Post starts indicating we should be concerned on their Opinion Page, I'm thinking we should go with that. (See the WP's June 16th Opinion Post "What to Do About Climate Change.") When the report is that the carbon level in the atmosphere is 400 parts per million [ppm]--when most climate scientists indicate that 350 ppm is where we should be--we should be worried. Moreover, the carbon levels hit the highest ever point in 2012 according to the International Energy Agency (IEA). These carbon level increases could raise us 2 degrees Celsius over the next 100 years. Those numbers change shorelines. Those numbers raise waters. 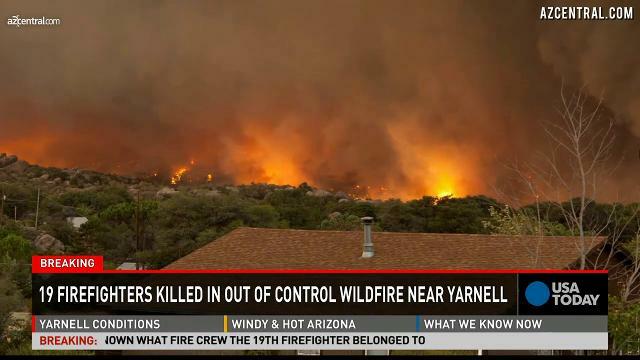 Those numbers and rising temperatures cause an increase in natural disasters such as hurricanes and wildfires. 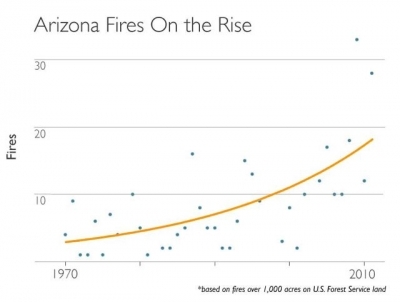 Do we need more natural disasters in wake of these Arizona wildfires and many distinctive and destructive storms fronts? I don't think so. To learn more about climate change, be sure to visit all the links above, as well as 350.org.